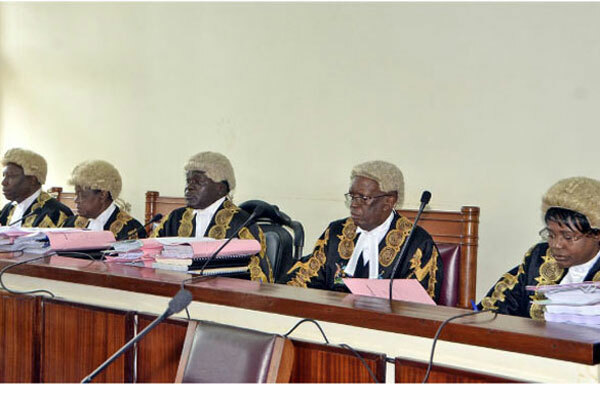 KAMPALA– After seven years, a panel of five judges of the Constitutional Court led by the Deputy Chief Justice, Alphonse Owiny-Dollo have put the walk-to-work judgment on notice. Justice Owiny-Dollo was joined by Remmy Kasule, Frederick Egonda-Ntende, Ezekiel Muhanguzi, and Christopher Madrama. In 2011, a human rights organization; Foundation for Human Rights Initiative (FHRI) petitioned the Constitutional Court challenging government’s move to charge walk-to-work protesters with treason and terrorism charges arguing that this denies citizens the constitutional right to freedom of expression. Led by FHRI director Dr Livingstone Ssewanyana’s petition against the Attorney General the move was supported by affidavits of political activists; Francis Mwijukye and Igrinid Turinawe. Dr. Ssewanyana contends that it is a violation of citizens’ freedom guaranteed by the Constitution for the police to arrest them for showing their discontentment with the current political situation but have no weapons to cause harm. Through their lawyer, Medard Lubega Ssegona they have cited incidents of the famous “walk-to-work ” campaign of the opposition party FDC from which many people who were engaging in this non-violate demonstration were charged in court with committing treacherous and terrorism acts. Sseggona adds that the act of police’s preventive arrest and detention without a charge is a violation of a suspect’s right to a fair trial. However, the Attorney General — through the Principle state attorney, Richard Adrole has opposed the petition. Adrole said that the law protects a person from physically harming him/herself and others, causing loss and damage of property and distortion of public order and decency.